Naylor Video Solutions - Institute of Scrap Recycling Industries Inc. Achieve powerful video messaging and maximum reach and engagement. 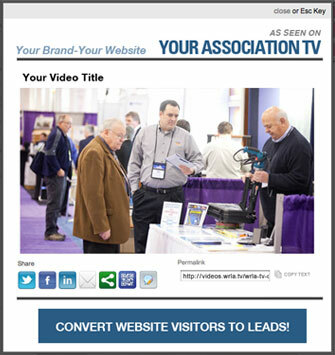 Click on the play button to watch a video highlighting the video services for marketers available from your association and Naylor. Sight, Sound & Motion: Use video to tell your story and engage your target market. Authentic Brand Alignment: Tell your story on Institute of Scrap Recycling Industries, Inc., in social media and outbound marketing with our Video Everywhere! Platform. Your branded video provides immediate awareness, authenticity, and trust to your video message. Maximize Reach: We make it simple and effective to place to your video everywhere your target market spends their time. Your video can be placed in a multitude of mediums, from your website, to outbound marketing materials, emails, social media, and QR codes in print ads and brochures. Convert Visitors into Leads, and Leads into Sales:All video platforms include an embed code, and two click-through banners (IAB Standard: 120 x 140 pixels, 300 x 250 pixels and 468 x 60 pixels) to make it easier for the viewer to learn more, register and buy.